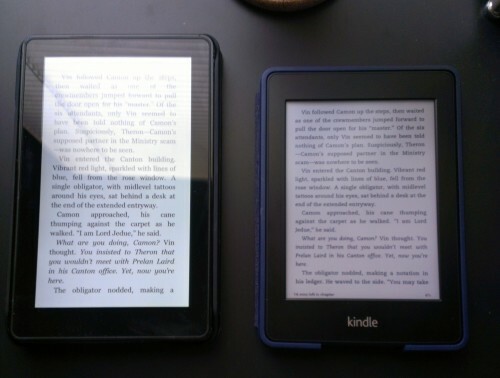 Yes, I am now the proud owner of not one, but two Kindles. A couple weeks ago, I finally received the Kindle I was talking about last month. Actually, that’s a lie. I did get a new Kindle, but it wasn’t the Kindle Fire HD I spent several hundred words on. Instead, I opted for the Kindle Paperwhite. Why the Paperwhite? It’s simple: I was spending 90% of my time with the device reading, and the Kindle Fire just isn’t a great device for that. The screen, even on the lowest setting and in dark mode, still strains my eyes in low light. The battery life, as well, just isn’t good enough for marathon reading sessions. Too often I’ve had my Kindle Fire die on me while I was reading at a coffee shop or elsewhere and couldn’t plug in, and that just wasn’t acceptable to me anymore. Having spent a bit of time with the new Kindle, I have to say that I’m pretty impressed. Not only does the screen really does mimic the look of ink on paper, but it even has a texture the mimics the roughness of book paper. All Amazon needs at this point is the smell! This is definitely going to be my new companion for road trips, lunch breaks, and doctor visits. Best of all, it arrived just in time for my excursion to the East Coast next week… not that reading is going to be high on my priority list while I’m over there. What does this mean for my once beloved Kindle Fire? Well, I probably won’t be taking it with me to New York, but I do plan on keeping my Kindle Fire, if for no other reason then my girlfriend is currently addicted to Plants vs Zombies. Not that I can blame her.